In a significant development, the Sikh clergy today rejected the ‘’hukmnama’’ issued by Takht Patna Sahib declaring Giani Gurdit Singh, author of controversial book Mundavni, as ‘’Tankhaiya’’. This is for the first time in the history of Sikhism that an edict issued by any Takht has been declared null and void by another Takht. Jathedars of both Patna Sahib and Hazoor Sahib were conspicuous by their absence at the meeting. "Shun politics while paying tributes to Sahibzadas and Mata Gujri." This is the message the Shiromani Gurdwara Parbandhak Committee has given to leaders of various political parties invited to participate in the tercentenary of martyrdom functions at Fatehgarh Sahib and Chamkaur Sahib later this month. 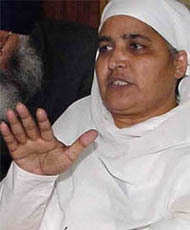 Bibi Jagir Kaur addresses the executive committee of the Shiromani Gurdwara Parbandhak Committee in Chandigarh on Wednesday. The Punjab and Haryana High Court has set aside the conviction of three of the four accused in the murder of Shiromani Akali Dal leader and former Kharar MLA Bachitter Singh. The three are Kulwinder Singh, Kuljit Singh and Inderpreet Singh. Seven Deputy Superintendents of Police — recruited under the sportsmen category — are yet to relinquish charge even though the Punjab Home Department had on Tuesday directed Director-General of Police A.A. Siddiqui to "relieve" them of their "duties". The General Category Welfare Federation, Punjab, today urged the Chief Minister, Capt Amarinder Singh not to implement the 85th amendment in Punjab till the hearing of a lawsuit filed in the Supreme Court in that connection. It is a dream come true for Dr B.S. Aulakh, drug researcher from Ludhiana, whose drug that produces female offspring of mammals has been patented by the World Intellectual Property Organisation, Geneva, Switzerland. Going ahead in full steam, the Jalandhar Doordarshan authorities are busy giving final touches to the production of its popular annual new year cultural programme, even as certain senior Punjabi folk singers are sore for having been “ignored” time and again and for not being included in the list of performers. Mr Birinder Singh Mann, president, SAD (A) Bathinda district, was yesterday nominated president of the youth wing of the SAD (Amritsar), Punjab, by its president, Mr Simranjit Singh Mann. The Governor of Punjab, Gen S.F. Rodrigues (retd), today underlined the need for evolving an effective cooperative mechanism by setting up an umbrella body to ensure allround welfare of ex-servicemen. Tehsildars, naib-tehsildars, BDPO’s of adjoining sub-divisions and blocks today joined the dharna being held by Phagwara revenue staff on Court Complex. They have been demanding the arrest of all those persons, including Mr P.S. Passi, President of the All-India Anti-Corruption Forum, who had used foul language against Ms Seema Singh, Naib-Tehsildar, Phagwara, on December 6 in her office. The United Nations Development Programme, India, will study the Ludhiana Municipal Corporation model for a case study of ‘Municipal Management and Capacity Building’. The MC, Ludhiana, is the only corporation in the country chosen by the UNDP for the study. The Vigilance Department has ordered an inquiry into the removal of a kidney of a poor woman allegedly by a doctor of government-run Guru Nanak Hospital. However, the victim, Premvati, wife of a worker of Bara Hanuman Mandir on the Durgiana Temple complex, today received the notice to join the inquiry at the local vigilance office hours after the scheduled time of the inquiry. Mr Kiranjit Singh Gehri, president, Dalit Sena, Punjab, today said that his party would approach the Punjab and Haryana High Court against the atrocities being committed on a section of the Scheduled Castes living in Gill Patti village in this district by a landlord with the help of a senior police official. Raising slogans against the privatisation of the Punjab State Electricity Board, thousands of employees and their families from all over the region marched towards the Punjab Secretariat for handing over a memorandum to the authorities concerned. A public interest petition has been filed in the Punjab and Haryana High Court seeking directions to the Panjab University authorities to put an end to alleged discrimination against students of MA Sociology-II (correspondence course) on the issue of usage library facilities. Almost all the agriculture technocrats of this district today observed a pen-down strike on a call given by the Agriculture Technocrats Action Committee, Punjab, to lodge their protest against the appointment of a non-technocrat as chief of Agriculture Department. The Punjab Government yesterday suspended Tejinder Singh, Sarpanch of Nagla village in Dera Bassi block of Patiala district, on the charges of encroaching upon the “shamlat land” of the village. Veterinary Officer Harjit Singh, posted at the Morinda Civil Veterinary Hospital, has been placed under suspension with immediate effect by Punjab’s Minister of Animal Husbandry, Fisheries and Dairy Development Jagmohan Singh Kang. Three persons, including an Army man, were arrested and fake currency, narcotics and arms were seized from them in a joint operation by the Majitha police and the BSF last night at a naka at Chakk Oul village under the police district. Two brothers have been booked for duping a Nihalsinghwala-based ‘arhtiya’ of Rs 5.65 lakh. According to sources, the complainant, Mr Bharat Bhushan, said farmers Jagdev Singh and Atma Singh had borrowed Rs 5.65 lakh from him, but instead of returning his money, later, they asked him to take their piece of land at Deena village in lieu of the amount. Guru Ram Dass Hospital Trust has decided to advertise and appoint a regular Principal for the Sri Guru Ram Dass Institute of Medical Sciences and Research, Amritsar. The seventh convocation of the Sant Longowal Institute of Engineering and Technology was held on the SLIET campus today. Ms Razia Sultana, Parliamentary Secretary, Punjab, was the chief guest while Dr S.K. Salwan, Vice-Chancellor, Punjab Technical University, Jalandhar, presided over the convocation. The NRI Sabha has decided to sponsor brilliant students of poor families to study in foreign countries. Apart from this, the sabha would also award scholarships to the toppers of government run secondary schools. Punjab Education Minister Harnam Das Johar has called a meeting of Teachers’ unions in the state on December 10 at 2 pm in Chandigarh.